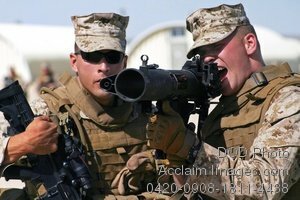 Description: Free, public domain image: U.S. Marine Soldiers During Weapons Training . U.S. Marines from the 1st Platoon, Foxtrot Company, 2nd Battalion, 3rd Marine Regiment, participate in immediate action drills during combined training exercise Mojave Viper at Marine Corps Air Ground Combat Center Twentynine Palms, Calif., March 11, 2009. Mojave Viper prepares Marines for deployment to Afghanistan in support of Operation Enduring Freedom. (DoD photo by Lance Cpl. James Purschwitz, U.S. Marine Corps.